"Duty calls again, and our hero dog Max returns to action in Max 2: White House Hero. His new assignment brings him to Washington, D.C. to serve on the U.S. president's Secret Service detail. When a foreign leader arrives with his precocious daughter Alex (Francesca Capaldi), tensions arise between both countries. First Son TJ (Zane Austin), along with Max and Alex, uncovers a dangerous plot that puts both kids and both nations in jeopardy. A highly-sensitive mission will push Max's specialized skills, intelligence and loyalty to the test." 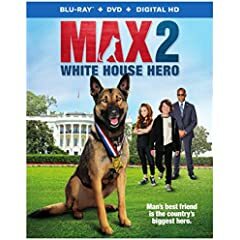 That is the official description for Max 2: White House Hero, now available on Blu-ray, DVD, and Digital HD from Warner Bros., which has provided NewTechReview with a NFR copy for review. Before sitting down to watch Max 2: White House Hero, you should understand that this film is geared specifically towards children. Unlike the previous Max film, which had a somewhat more serious storyline about a military dog who suffered the loss of his Marine Corps master, the plot and character development in Max 2: White House Hero are fairly simple. Here we're treated to more of a real-life Scooby Doo mystery with some wonderful stunts by Max the dog. If you can turn off your analytical mind and just watch the show, you might enjoy viewing it along with your kids. I applaud the actors for trying their best to keep the story interesting for everyone, but most adults will figure out the plot fairly easily. Plus, there's no competing with the canine stunt sequences. All of the best scenes, of course, are when Max performs his heroics. My favorites include when Max escaped from his cage to rescue TJ, when he jumped head first into a river to rescue Alex from drowning, and especially the scene where he jumps through the open window of a moving van to stop the bad guys from getting away. With an aspect ratio of 1.78:1 in 1080p MPEG-4 AVC, we're treated to a clear, excellent, and vibrant picture. The white water rafting sequence is especially immersive and colorful. The DTS-HD Master Audio 5.1 soundtrack is also put to good use, especially during the outdoor Camp David scenes. * Max 2: A Ruff Life - This featurette showcases animal trainer Mathilde de Cagny and the team of dogs used to play Max, which by the way is the same team from the previous film. Mathilde shows off the dogs and their excellent talents. * Kids on the Case: The Making of Max 2 - As its name implies, this featurette is a behind-the-scenes look at the making of the film, but instead of the usual director-led look, the child stars Zane Austin and Francesca Capaldi take us on the tour. While the Max 2: White House Hero storyline and character development aren't quite fulfilling enough for most adults, it can still be a fun ride for most children. The quality of the Blu-ray video and audio are excellent and the stunt scenes performed by Max the dog are enjoyable for everyone. I'm willing to bet your kids will enjoy the film.